Dr Vu Tien Loc, President of the Vietnam Chamber of Commerce and Industry (VCCI), hosted warm receptions and expressed gratitude to the ambassadors of Malaysia, New Zealand, Australia and the Philippines at the VCCI Headquarters, following the successful hosting of APEC Summit Week in Vietnam in November 2017. At the meeting with Malaysian Ambassador to Vietnam Zamruni Khalid, Dr Loc highly appreciated new progress in the Vietnam - Malaysia relationship, especially after the two countries began the strategic partnership in 2015. The VCCI President hoped that the two countries’ leaders will maintain regular visits and contacts in order to build up the foundation and shape the orientation for a more credible and trustworthy relationship. He asked Malaysia to jointly organise Vietnam - Malaysia Business Forum in the coming time, and facilitate trade and investment promotion for the two business communities. Loc also announced that the Vietnam Business Summit (VBF), a side event to the APEC Summit, was approved to be an annual event in November by the Prime Minister of Vietnam. And, he hoped Malaysia will have more support programmes and business matching programmes for companies of both sides. Expressing his confidence in cooperation, Malaysian Ambassador Zamruni Khalid believed that Vietnam is now the fourth largest trade partner of Malaysia in ASEAN and the 12th in the world. Currently, Malaysia is the seventh largest FDI investor in Vietnam with a total registered capital of US$12.3 billion by the end of 2016. He added that a business delegation of Malaysia will come to Vietnam in 2018 and hoped that it will receive support and cooperation from VCCI in exchanging information and connecting businesses between the two countries. 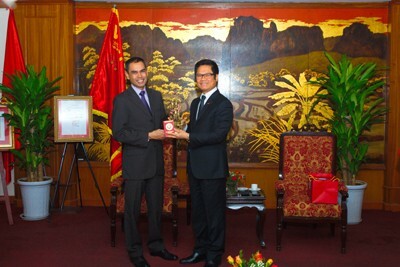 The ambassador believed that Malaysia's investment in Vietnam will increase further in the future. At the meetings with ambassadors of Australia, New Zealand and the Philippines, VCCI President Loc highly appreciated their support before and during the APEC Vietnam Year in general and the APEC Vietnam Summit 2017 in particular. Their assistance was an important contribution to the successful organisation of APEC Vietnam 2017. He hoped that trade and investment ties between Vietnam and APEC economies in general, and Australia, New Zealand and the Philippines in particular, will further thrive. He praised the tremendous power that dominates the world of APEC economies. From 12 founding economies at first, APEC now gathers 21 member economies, which account for 39 per cent of the world population and 57 per cent of global GDP. As the leader of a national agency that brings together and represents the business community, employers and business associations in Vietnam, Loc hailed and welcomed investors from APEC economies to seek investment opportunities in Vietnam. He added that Vietnam presently has more than 650,000 enterprises, of which more than 300,000 are VCCI members. VCCI will further promote its bridging role to connect the business community, including FDI investors, with the Government to seek an enabling business environment. President Loc also sent thank-you letters and souvenirs to economic leaders and ambassadors of the guest countries.